The co-working space in Bandra-Kurla Complex offers a breathtaking view of the lush green Mumbai Cricket Association Stadium. Awfis has a seating capacity of 423 people and the swanky collaboration area comes with a live counter, high tables, modular and plush seating, which then leads to an entertainment zone. One of the most interesting aspects of designing a co-working space is understanding what draws people to the location. Co-working spaces are much more than the convenience and price tag: it is a community of individuals looking for an office-like setup within a non-office looking space. 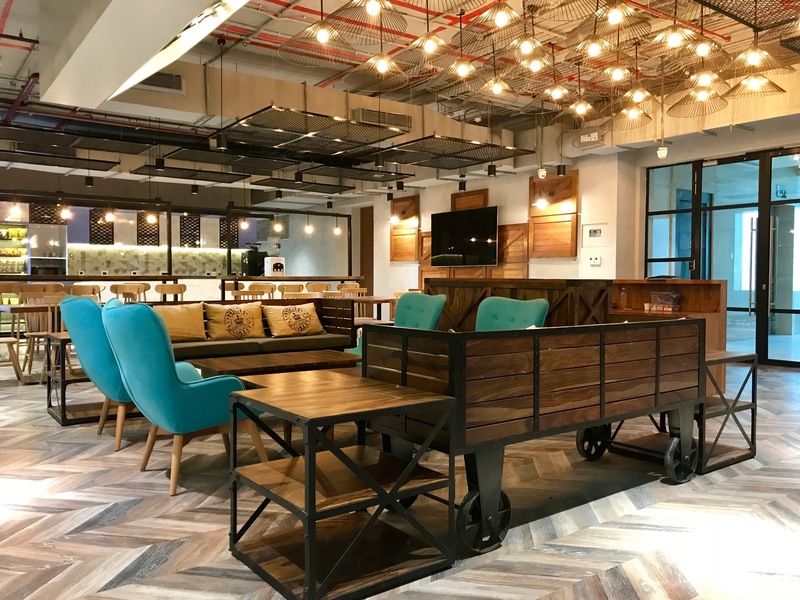 When NCUBE Design was asked to design a co-working space for Awfis, a startup in Mumbai’s Bandra-Kurla Complex (BKC), their intent was to design a space that gives professionals an excuse to stay curious, to observe and interact. “We believe that workspaces should have elements that bring the outdoors inside. Our attempt was to create a futuristic space that resonates with a new-age India,” says Karekar. The major aim of the NCUBE team, helmed by interior designer Suyog Karekar, was on setting up compact and cosy meeting lounges with comfortable furniture for the professionals who worked there. Sprawling over 23,000 square feet, the Awfis space at BKC boasts of plush industrial interiors. The brief from Awfis was clear: a vibrant, minimal space equipped with collaborative areas that flaunt interesting furniture, installations and flexible settings for events. There was also a very clear focus on enclosed spaces with good acoustics and flexible meeting areas that could easily be reconfigured. “We had to come up with a blend of design and aesthetics that found a place in every user’s visual and psychological acceptance. We wanted the space to radiate and exhibit the energy of today’s young entrepreneurs, while still allowing them to see, touch and feel the raw ground of their belonging,” says Karekar when asked about the most important factor when it comes to designing a co-working space. Awfis has a seating capacity of 423 people and the swanky collaboration area comes with a live counter, high tables, modular and plush seating, which then leads to an entertainment zone. A spacious cafe serves as the perfect hangout zone for the members of the co-working space. The centre offers a breathtaking view of the lush green Mumbai Cricket Association Stadium. Constructed meticulously, it’s a perfect blend of design and artsy aesthetics. The unique phone booths and meeting pods at every centre are capacious and provide open space for community members to conduct meetings.